Octreotide (trade name Sandostatin, among others) is an octapeptide that mimics natural somatostatin pharmacologically, though it is a more potent inhibitor of growth hormone, glucagon, and insulin than the natural hormone. It was first synthesized in 1979 by the chemist Wilfried Bauer. 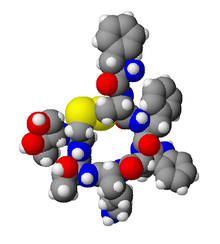 Octreotide is used for the treatment of growth hormone producing tumors (acromegaly and gigantism), when surgery is contraindicated, pituitary tumors that secrete thyroid stimulating hormone (thyrotropinoma), diarrhea and flushing episodes associated with carcinoid syndrome, and diarrhea in people with vasoactive intestinal peptide-secreting tumors (VIPomas). Octreotide is often given as an infusion for management of acute hemorrhage from esophageal varices in liver cirrhosis on the basis that it reduces portal venous pressure, though current evidence suggests that this effect is transient and does not improve survival. Octreotide is used in nuclear medicine imaging by labelling with indium-111 (Octreoscan) to noninvasively image neuroendocrine and other tumours expressing somatostatin receptors. More recently, it has been radiolabelled with carbon-11 as well as gallium-68, enabling imaging with positron emission tomography (PET), which provides higher resolution and sensitivity. Octreotide can also be used in the treatment of acromegaly, a disorder of excessive growth hormone (GH). Octreotide, being a somatostatin analog, inhibits the release of GH from the pituitary gland through a process normally involved in negative feedback. Octreotide helps in management of the fistula by reducing gastrointestinal secretions and inhibiting gastrointestinal motility, thus controlling and reducing its output. The value in healing intestinal fistulas is yet to be proven and routine use is limited because of the side effects. Octreotide is also used in the treatment of refractory hypoglycemia in neonates and sulphonyl urea induced hypoglycemia in adults. Octreotide has not been adequately studied for the treatment of children as well as pregnant and lactating women. The drug is given to these groups of patients only if a risk-benefit analysis is positive. The most frequent adverse effects (more than 10% of patients) are headache, hypothyroidism, cardiac conduction changes, gastrointestinal reactions (including cramps, nausea/vomiting and diarrhoea or constipation), gallstones, reduction of insulin release, hyperglycemia or sometimes hypoglycemia, and (usually transient) injection site reactions. Slow heart rate, skin reactions such as pruritus, hyperbilirubinemia, hypothyroidism, dizziness and dyspnoea are also fairly common (more than 1%). Rare side effects include acute anaphylactic reactions, pancreatitis and hepatitis. One study reported a possible association with rheumatoid arthritis. Some studies reported alopecia in patients who were treated by octreotide. Rats which were treated by octreotide experienced erectile dysfunction in a 1998 study. A prolonged QT interval has been observed in patients, but it is uncertain whether this is a reaction to the drug or part of the patients' illnesses. Octreotide is useful in overdose management of sulfonylurea type hypoglycemic medications, when recurrent or refractory to parenteral dextrose. Mechanism of action is the suppression of insulin secretion. Octreotide can reduce the intestinal reabsorption of ciclosporin, possibly making it necessary to increase the dose. Patients with diabetes mellitus might need less insulin or oral antidiabetics when treated with octreotide, as it inhibits glucagon secretion more strongly and for a longer time span than insulin secretion. The bioavailability of bromocriptine is increased; besides being an antiparkinsonian, bromocriptine is also used for the treatment of acromegaly. reduce portal vessel pressures in bleeding varices. It has also been shown to produce analgesic effects, most probably acting as a partial agonist at the mu opioid receptor. Octreotide is absorbed quickly and completely after subcutaneous application. Maximal plasma concentration is reached after 30 minutes. The elimination half-life is 100 minutes (1.7 hours) on average when applied subcutaneously; after intravenous injection, the substance is eliminated in two phases with half-lives of 10 and 90 minutes, respectively. Octreotide has also been used off-label for the treatment of severe, refractory diarrhea from other causes. It is used in toxicology for the treatment of prolonged recurrent hypoglycemia after sulfonylurea and possibly meglitinide overdose. It has also been used with varying degrees of success in infants with nesidioblastosis to help decrease insulin hypersecretion. Several clinical trials have demonstrated the effect of octreotide as acute treatment (abortive agent) in cluster headache, where it has been shown that administration of subcutaneous octreotide is effective when compared with placebo. Octreotide has also been investigated in patients with pain from chronic pancreatitis. It has been used in the treatment of malignant bowel obstruction. Octreotide may be used in conjunction with midodrine to partially reverse peripheral vasodilation in the hepatorenal syndrome. By increasing systemic vascular resistance, these drugs reduce shunting and improve renal perfusion, prolonging survival until definitive treatment with liver transplant. Similarly, octreotide can be used to treat refractory chronic hypotension. While successful treatment has been demonstrated in case reports, larger studies have failed to demonstrate efficacy in treating chylothorax. A small study has shown that octreotide may be effective in the treatment of idiopathic intracranial hypertension. Octreotide has been used experimentally to treat obesity, particularly obesity caused by lesions in the hunger and satiety centers of the hypothalamus, a region of the brain central to the regulation of food intake and energy expenditure. The circuit begins with an area of the hypothalamus, the arcuate nucleus, that has outputs to the lateral hypothalamus (LH) and ventromedial hypothalamus (VMH), the brain's feeding and satiety centers, respectively. The VMH is sometimes injured by ongoing treatment for acute lymphoblastic leukemia (ALL) or surgery or radiation to treat posterior cranial fossa tumors. With the VMH disabled and no longer responding to peripheral energy balance signals, "Efferent sympathetic activity drops, resulting in malaise and reduced energy expenditure, and vagal activity increases, resulting in increased insulin secretion and adipogenesis." "VMH dysfunction promotes excessive caloric intake and decreased caloric expenditure, leading to continuous and unrelenting weight gain. Attempts at caloric restriction or pharmacotherapy with adrenergic or serotonergic agents have previously met with little or only brief success in treating this syndrome." In this context, octreotide suppresses the excessive release of insulin and may increase its action, thereby inhibiting excessive adipose storage. In a small clinical trial in eighteen pediatric patients with intractable weight gain following therapy for ALL or brain tumors and other evidence of hypothalamic dysfunction, octreotide reduced body mass index (BMI) and insulin response during glucose tolerance test, while increasing parent-reported physical activity and quality of life (QoL) relative to placebo. In a separate placebo-controlled trial of obese adults without known hypothalamic lesions, obese patients who received long-acting octreotide lost weight and reduced their BMI compared to patients receiving placebo; post hoc analysis suggested greater effects in patients receiving the higher dose of the drug, and among "Caucasian patients having insulin secretion greater than the median of the cohort." "There were no statistically significant changes in QoL scores, body fat, leptin concentration, Beck Depression Inventory, or macronutrient intake", although patients taking octreotide had higher blood glucose after a glucose tolerance test than those receiving placebo. ^ Gøtzsche PC, Hróbjartsson A (2008). "Somatostatin analogues for acute bleeding oesophageal varices". Cochrane Database Syst Rev (3): CD000193. doi:10.1002/14651858.CD000193.pub3. PMID 18677774. ^ Chin J, Vesnaver M, Bernard-Gauthier V, Saucke-Lacelle E, Wängler B, Wängler C, Schirrmacher R (2013). "Amino Acids: Direct one-step labeling of cysteine residues on peptides with 11C-methyl triflate for the synthesis of PET radiopharmaceuticals". Amino Acids. 45 (5): 1097–108. doi:10.1007/s00726-013-1562-5. PMID 23921782. ^ a b c d e Haberfeld, H, ed. (2009). Austria-Codex (in German) (2009/2010 ed.). Vienna: Österreichischer Apothekerverlag. ISBN 978-3-85200-196-8. ^ a b c d Dinnendahl, V; Fricke, U, eds. (2010). Arzneistoff-Profile (in German). 8 (23 ed.). Eschborn, Germany: Govi Pharmazeutischer Verlag. ISBN 978-3-7741-9846-3. ^ Hovind P, Simonsen L, Bülow J (March 2010). "Decreased leg glucose uptake during exercise contributes to the hyperglycaemic effect of octreotide". Clin Physiol Funct Imaging. 30 (2): 141–5. doi:10.1111/j.1475-097X.2009.00917.x. PMID 20132129. ^ Saif MW (July 2011). "Rheumatoid arthritis associated with the use of Sandostatin® LAR® depot in a patient with pancreatic neuroendocrine tumor. An association or a coincidence? The first case report" (PDF). JOP. 12 (4): 425–8. PMID 21737909. Lay summary – eHealthMe.com. ^ van der Lely AJ, de Herder WW, Lamberts SW (November 1997). "A risk-benefit assessment of octreotide in the treatment of acromegaly". Drug Saf. 17 (5): 317–24. doi:10.2165/00002018-199717050-00004. PMID 9391775. ^ Kapicioglu S, Mollamehmetoglu M, Kutlu N, Can G, Ozgur GK (January 1998). "Inhibition of penile erection in rats by a long-acting somatostatin analogue, octreotide (SMS 201-995)". Br J Urol. 81 (1): 142–5. doi:10.1046/j.1464-410x.1998.00520.x. PMID 9467491. ^ Klopp, T, ed. (2010). Arzneimittel-Interaktionen (in German) (2010/2011 ed.). Arbeitsgemeinschaft für Pharmazeutische Information. ISBN 978-3-85200-207-1. ^ Maurer R, Gaehwiler BH, Buescher HH, Hill RC, Roemer D (Aug 1982). "Opiate antagonistic properties of an octapeptide somatostatin analog". Proceedings of the National Academy of Sciences USA. 79 (15): 4815–7. doi:10.1073/pnas.79.15.4815. PMC 346769. PMID 6126877. ^ Allen MP, Blake JF, Bryce DK, Haggan ME, Liras S, McLean S, Segelstein BE (2000). "Design, synthesis and biological evaluation of 3-amino-3-phenylpropionamide derivatives as novel mu opioid receptor ligands". Bioorganic & Medicinal Chemistry Letters. 10 (6): 523–6. doi:10.1016/s0960-894x(00)00034-2. PMID 10741545. ^ Matharu MS, Levy MJ, Meeran K, Goadsby PJ (2004). "Subcutaneous octreotide in cluster headache: randomized placebo-controlled double-blind crossover study". Ann Neurol. 56 (4): 488–94. doi:10.1002/ana.20210. PMID 15455406. ^ Uhl W, Anghelacopoulos SE, Friess H, Büchler MW (1999). "The role of octreotide and somatostatin in acute and chronic pancreatitis". Digestion. 60 Suppl 2 (2): 23–31. doi:10.1159/000051477. PMID 10207228. ^ Shima Y, Ohtsu A, Shirao K, Sasaki Y (May 2008). "Clinical efficacy and safety of octreotide (SMS201-995) in terminally ill Japanese cancer patients with malignant bowel obstruction". Jpn. J. Clin. Oncol. 38 (5): 354–9. doi:10.1093/jjco/hyn035. PMID 18490369. ^ Skagen C, Einstein M, Lucey MR, Said A (Feb 2009). "Combination Treatment With Octreotide, Midodrine, and Albumin Improves Survival in Patients With Type 1 and Type 2 Hepatorenal Syndrome". J Clin Gastroenterol. 43 (7): 680–5. doi:10.1097/MCG.0b013e318188947c. PMID 19238094. ^ Patient.info (Feb 2013). "Hypotension". ^ Kilic D, Sahin E, Gulcan O, Bolat B, Turkoz R, Hatipoglu A (2005). "Octreotide for treating chylothorax after cardiac surgery". Tex Heart Inst J. 32 (3): 437–9. PMC 1336729. PMID 16392238. ^ Siu SL, Lam DS (2006). "Spontaneous neonatal chylothorax treated with octreotide". J Paediatr Child Health. 42 (1–2): 65–7. doi:10.1111/j.1440-1754.2006.00788.x. PMID 16487393. ^ Chan EH, Russell JL, Williams WG, Van Arsdell GS, Coles JG, McCrindle BW (November 2005). "Postoperative chylothorax after cardiothoracic surgery in children". Ann. Thorac. Surg. 80 (5): 1864–70. doi:10.1016/j.athoracsur.2005.04.048. PMID 16242470. ^ Panagopoulos GN, Deftereos SN, Tagaris GA, Gryllia M, Kounadi T, Karamani O, Panagiotidis D, Koutiola-Pappa E, Karageorgiou CE, Piadites G (2007). "Octreotide: a therapeutic option for idiopathic intracranial hypertension". Neurol Neurophysiol Neurosci: 1. PMID 17700925. ^ a b c d Lustig RH, Hinds PS, Ringwald-Smith K, Christensen RK, Kaste SC, Schreiber RE, Rai SN, Lensing SY, Wu S, Xiong X (June 2003). "Octreotide therapy of pediatric hypothalamic obesity: a double-blind, placebo-controlled trial". J. Clin. Endocrinol. Metab. 88 (6): 2586–92. doi:10.1210/jc.2002-030003. PMID 12788859. ^ Flier JS (2004). "Obesity wars: Molecular progress confronts an expanding epidemic". Cell. 116 (2): 337–50. doi:10.1016/S0092-8674(03)01081-X. PMID 14744442. ^ Boulpaep, Emile L.; Boron, Walter F. (2003). Medical physiologya: A cellular and molecular approach. Philadelphia: Saunders. p. 1227. ISBN 978-0-7216-3256-8. ^ Lustig RH (2011). "Hypothalamic obesity after craniopharyngioma: mechanisms, diagnosis, and treatment". Front Endocrinol (Lausanne). 2: 60. doi:10.3389/fendo.2011.00060. PMC 3356006. PMID 22654817. ^ Lustig RH, Greenway F, Velasquez-Mieyer P, Heimburger D, Schumacher D, Smith D, Smith W, Soler N, Warsi G, Berg W, Maloney J, Benedetto J, Zhu W, Hohneker J (February 2006). "A multicenter, randomized, double-blind, placebo-controlled, dose-finding trial of a long-acting formulation of octreotide in promoting weight loss in obese adults with insulin hypersecretion". Int J Obes (Lond). 30 (2): 331–41. doi:10.1038/sj.ijo.0803074. PMC 1540404. PMID 16158082. This page was last edited on 12 April 2019, at 01:42 (UTC).